I meant to post this entry in January, for anyone who may have resolved to get their life a little more organized in 2013. This app is perfect if you're an active cook who'd like to have an easy way to keep all of your recipes in one place. With so many ways to access recipes these days (online, in ebooks, magazines, or regular old recipe books), keeping everything organized can be a bit overwhelming. For many years I've been searching online for recipes, or using recipes from my cookbooks, as well as those from friends and family. After I amassed many cookbooks, bookmarked dozens of recipes, and started a Word document with some of my favorites, things quickly became jumbled in my head. It was often hard to track down things I'd made, and I'd find myself needlessly searching through many different sources just to find a recipe I'd used a few months or even weeks ago. Enter the iPad...! 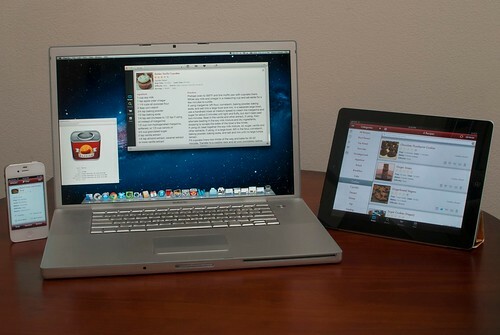 When I received an iPad for Christmas in 2010, I never could have imagined it would have a place in my kitchen. My kitchen was overly crowded as it was, and I worried about the device taking up valuable counter space. I had an even harder time imagining an effective program that would allow me to quickly and easily enter and access all of the information that I needed. The issue of counter space was resolved by my boyfriend last year. He thoughtfully came up with an elegant solution for using the iPad in the kitchen. It requires no counter space whatsoever, because it's a wall mount (the Wallee wall mount, to be exact). The truth is there are all kinds of elegant shelving, mounting, and display solutions for your iPad, and this app also works on your iPhone, so I'll leave that part to you. If you're looking for a fantastic app that allows you to easily access and display your recipes, I've got a great suggestion for you: it's called Paprika. 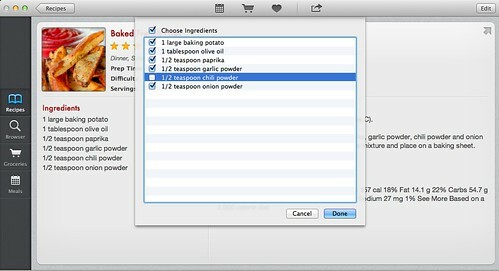 In searching for recipe management apps last year, I stumbled upon Paprika. It's a wonderful program that I highly recommend. It's available for Mac computers, iPads, and your iPhone and it can sync seamlessly across all of your devices. If you've got a collection of recipes that you'd like to have on hand at anytime, I couldn't recommend this app more highly! It's available through the Apple App Store, it's $19.99 for the desktop version, and 4.99 for the iPad or iPhone or Android version. Here you can see the opening screen, which takes you to your "Recipes" screen. Notice at the top you can search recipes by name. Since I usually know exactly what recipe I'm looking for, I use this feature the most frequently. On the lefthand side of the screen, though, you can see that you can also organize recipes by category. You can create whatever categories you like (such as "Dinner", "Snacks", "Appetizers", "Cupcakes" etc. 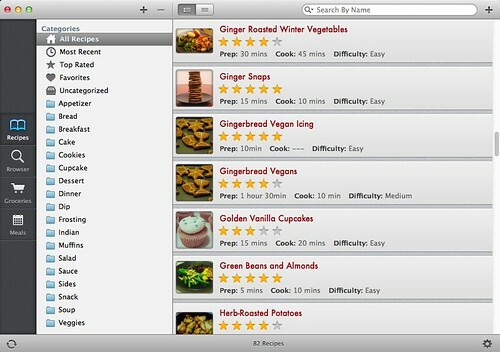 ), and apply as many categories as you want to each recipe, for easy cross-referencing. You can also rate the photo with 1-5 stars, and easily add it to your "favorites" list as well. 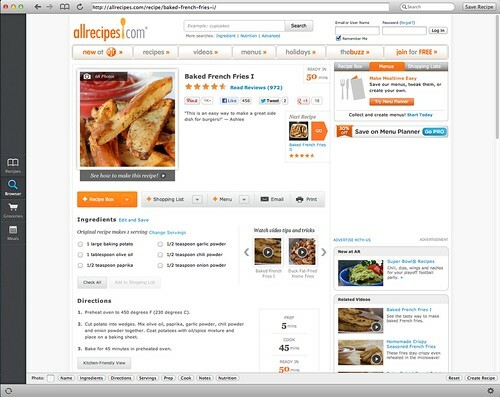 On the far left, above, you can see four main views to select: "Recipes" (pictured above), "Browser", "Groceries" and "Meals." Above you can see the main categories in a "recipe card." You can add your own photo, or if you import a recipe from the web it will automatically include the associated photograph. This screen also displays the ratings and categories you have assigned to the recipe. When creating a recipe card, you are prompted to enter in the Prep Time, Cook Time, Difficulty, Source of the Recipe, Servings, Ingredients, and Directions. I like the fact that they've included the option to enter "Source." It allows me to easily access the online recipes again or double-check my sources, if needed. Perhaps one of my favorite parts about having all of your recipes organized digitally is that they're so easy to share. You can easily export any recipe, either via email or printing. That means if I have my phone with me and someone asks for a recipe, I can just send it straight to them, right then and there! The "Browser" category (pictured below) lets you import recipes directly from the web. It's an awesome feature of this application, that allows you to put an entire recipe in your collection in literally a couple of seconds. 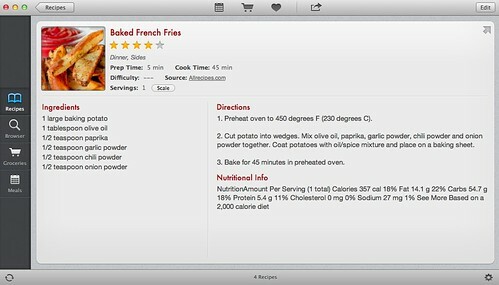 Here you can see I've searched the web, through the "Browser" feature, for baked french fries, and followed a link to a recipe on Allrecipes.com. By just clicking "Save Recipe" in the upper right hand corner of my screen, the application will instantly import all of this information into a new recipe in my library, including all of the ingredients, instructions, photo, and even preparation time and number of servings (seen below). Pretty great, right? In 5 seconds time I've found my recipe and saved it in my library. If for some reason the application has trouble importing your recipe, you can always simply copy and paste whatever information you'd like into the various fields. With a click of a button, you can also submit a request to the App developers to support importation of recipes from that site. I also recently learned about the bookmarklet feature available for Paprika. It allows you to easily import recipes to Paprika when viewing them through your normal browser. It simply adds a button to your bookmark toolbar that says "Save Recipe." You just click the button when you're on a page you'd like to save, and the next time you open Paprika, the recipe will be there! 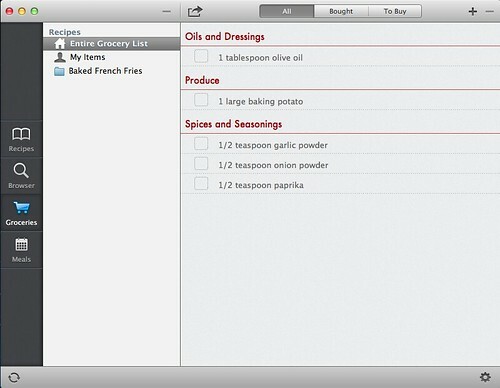 As for the "Groceries" window in the application, you can add ingredients from any recipe to your grocery list, by simply clicking the cart icon in the top of the window. The ingredients from the recipe will then be pulled up, allowing you to select or deselect any ingredients that you would like to add to your list. You can do this for as many recipes as you'd like, and of course add other items to your grocery list manually, if needed. One of the best aspects of the grocery list is that it categorizes the items by area in the grocery store. The grocery list can be emailed or printed, but if you have the application on your phone or iPad, you can easily access it in the store! Another component of the application which you may or may not find useful, is the "Meals" feature. 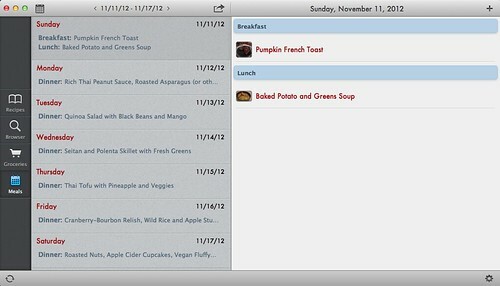 This allows you to enter meals into a calendar for particular days. I don't actually use this too often, but if I'm making a large meal with many different components, I find it helpful. I can then easily switch between the different recipes I'm using for that evening. For my far-sighted readers out there: if the font looks small on the above screen shots, it is. But you can adjust font settings in the app (the font pictured above is "small" but it can be sized up to "extra-large"), so don't despair! 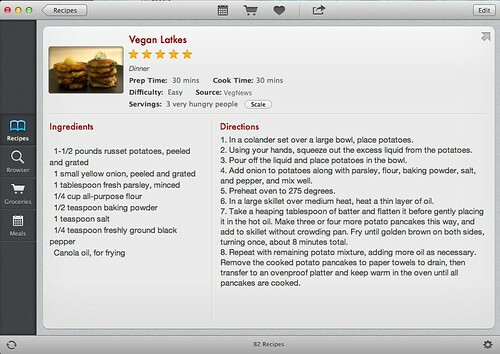 The app is really geared towards users cooking while using the iPad. This is the easiest way to see your entire recipe and list of ingredients on one screen (as opposed to the iPhone where you do have to click between these items, although it's relatively streamlined). Certain features on the iPad and iPhone are not available on the desktop version. I think this is limited to the "tools" feature, which pops up whenever you view a recipe on your iPad or iPhone. This feature gives you three categories: "Timers", "Converter", and "Scale Ingredients. ""Timers" is just what you'd imagine; it allows you to add as many timers as you like, and you can name each one to keep track of multiple items while cooking. Converter allows you to easily convert from one measurement to another (tablespoons to teaspoons, for instance), although I find I need this infrequently, due to the "Scale Ingredients" tool. When you click "Scale Ingredients" you can scale the recipe that you are making. The program will automatically, scale the recipe to whatever quantity you select: you can 1/2 the recipe, or multiply by any fraction or multiple up to 100. So that's Paprika in a nutshell. It's incredibly user-friendly. Since getting it last spring, I've introduced it to some friends and family members, and everyone's loved it! Had it a few months now, love it, couldn't live without it. Screen Recorder hasn't been much easier earlier. This we have a strongest display recording tool that's completely free, safe & saturated in options which aids one to recapture displays readily. Screen Recorder app contains ton of capabilities such as; display screen recording, sharing and editing.